The opening lines of an ancient mele (chant) describes Lāna‘i with the following line — “Hanohano Lāna‘i i ke kauna‘oa, koku kapa ‘ahu‘ula kau po‘ohiwi…” Lāna‘i is distinguished by the lei of kauna‘oa (Cuscuta sandwichiana), which looks like a feather cloak set upon its shoulders. The island of Lāna‘i is sixth in size of the major islands in the archipelago, and in many ways, it is a reminder of earlier times in Hawai‘i. Prior to western contact, it was home to some 6,000 native residents. Today it is host to around 3,200 residents. The honua ola (bio-cultural landscape) of Lāna‘i is richly storied, largely untouched, and little known. The Lāna‘i Culture & Heritage Center (Lāna‘i CHC) is a community-based charitable organization that strives to provide opportunities for students, community members and visitors to learn more about the island’s unique history. We have been privileged to partner with many organizations on both the local and national level and been the recipient of several significant grants. 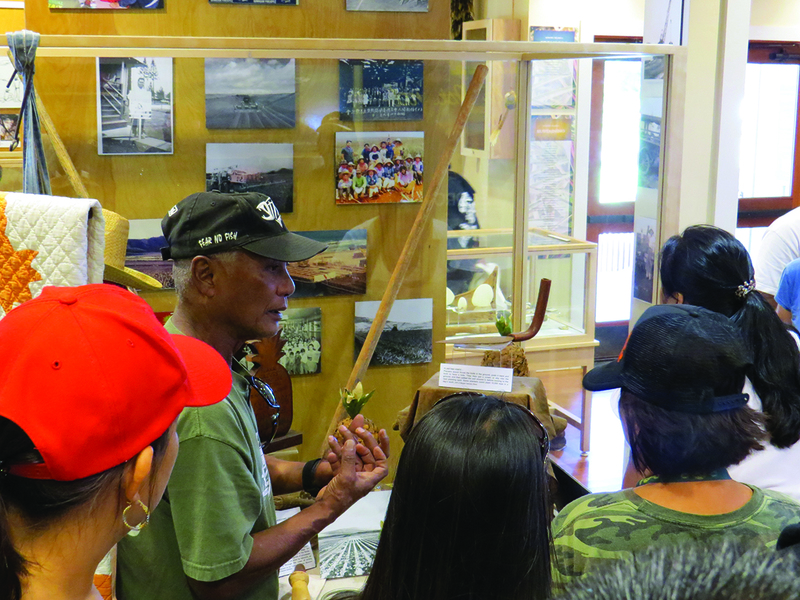 Since opening in 2007, Lāna‘i CHC has served nearly 100,000 guests and residents through programs which include visiting a small museum and outdoor experiences. 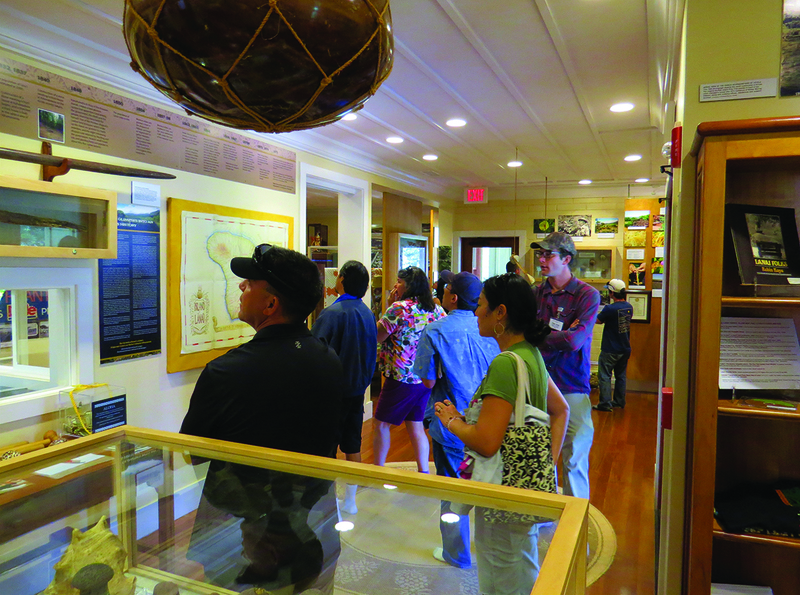 Among the notable programs for residents are the curation of indigenous artifacts, plantation era records and memorabilia representative of the cultural groups who have made Lāna‘i home. The collection includes thousands of records, artifacts, photos, oral history interviews, maps and more — many of which cannot be found in other collections. While artifacts and the material culture of place are fragile and in need of protection, even more fragile facets of history are the knowledge and recollections of elder kama‘āina (people of the land). Since starting Lāna‘i CHC, we have conducted nearly 150 oral history interviews with elder kama‘āina of Lāna‘i, aged 60s to 102. Many have since passed away. The interviews have been recorded in both audio and video format, include multicultural backgrounds, and share the experiences of life that have made the community what it is today. The 100 years of life on Lāna‘i, described by those who lived through and made the history of the island make the story of Lāna‘i more than just items displayed in glass cases. The voices and faces of the interviewees ground us in our community legacy, remind us of long-held values and inspire us. 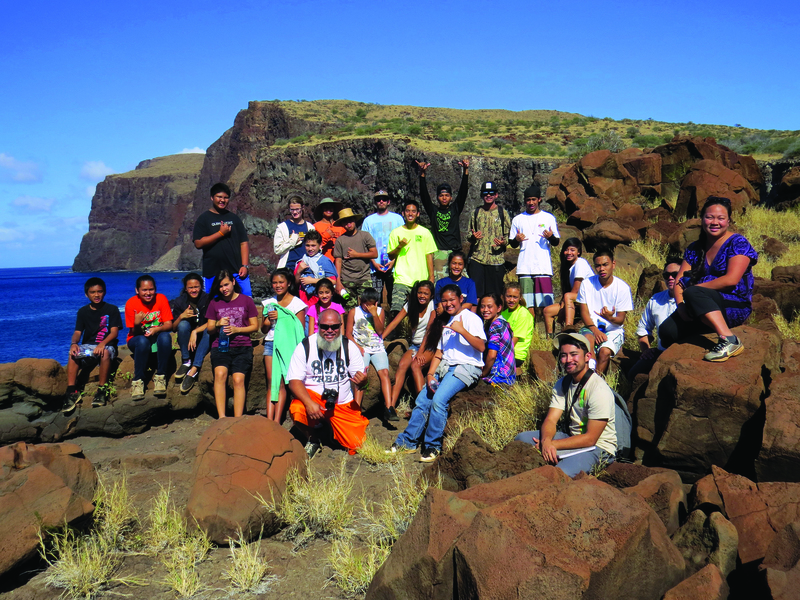 Lāna‘i High & Elementary School students at Kaunolū, with the famed Pali o Kāholo in the background. We’ve also developed curricula and engaged Lāna‘i students in cultural literacy/place-based education programs and partnered with the majority landowner, Pūlama Lāna‘i, in access and protection of sites across the island. The access is more than a just “go see.” Through field programs, we engage residents, students (on island, from across the state and from abroad) in stewardship programs from the mountains to the reefs to build a new generation of resource managers and interpreters to lead the future in care for the honua ola. 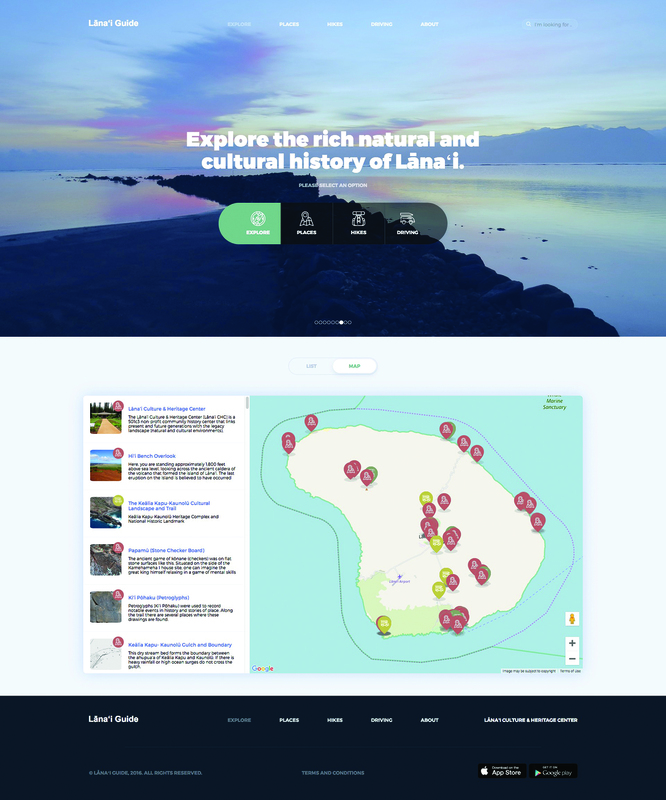 One of the tools available to residents and visitor alike is the Lāna‘i Guide, a GPS web-enabled app (free at Google Play or the Apple store) that was designed as an interactive tool to engage users in the spirit and history of place. Because the information can also be accessed remotely from anywhere on earth (www.lanaiguideapp.org), visitors, students and researchers may also plan ahead for their time on Lāna‘i. The live GPS-enabled app directs the traveler (be it by vehicle, foot or bike) on the ground in real time. Travelers will find locations on the map and have access to various levels of information depending on their own interests. The content also includes links to other resource sites, photos and maps, audio files with narrations, songs or chants of old, and interesting video clips.